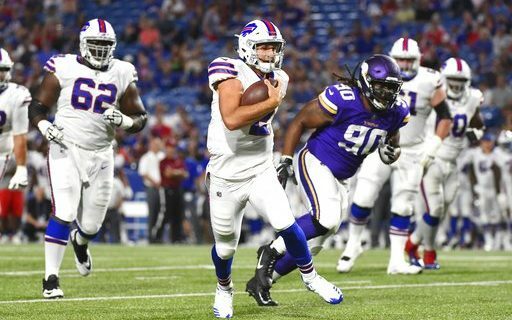 The Bills 17-10 preseason loss to the Vikings was much like a lot of preseason games. A few good moments. Some young players that shined. But mostly an uninspiring, penalty-filled, hardly watchable game full of players you haven’t heard of, and never will. Before some mentions of the players who flashed before our eyes, let’s focus on the position that everyone always does: quarterback. Tyrod Taylor: 5/8, 46 yards. Taylor didn’t lead any scoring drives, and was under heavy rush by the Vikings defense. But he did look good completing his first three passes to Sammy Watkins, a very good sign of things to come. Nothing that Taylor showed in this game should make any Bills fan feel much better about him, or feel worse about him. T.J. Yates: 6/11, 48 yards. Not a very impressive outing from the Bills #2 QB. He too, struggled to move the offense and seemed out of sorts with his backup receivers. Again, about what was expected. He’s a solid veteran who knows the new Rick Dennison offensive system. He’s a guy you hope you don’t have to play, but if you do, he should be able to get you through a series, a quarter or a game. He looked to me like every other backup quarterback in the league. Nathan Peterman: 13/25, 112 yards, TD. A good debut for the rookie. He made some good throws, especially the touchdown to Dez Lewis. He made some really bad throws, especially one across the middle that should have been intercepted. What concerned me the most was his tendency to run. He did that four times. Yes, getting out of trouble and making something happen is good. But young quarterbacks tend to do that too quickly, instead of standing in the pocket and making a throw. I hope that’s not what happened. I’m not going to panic in Peterman’s first appearance, but that is something to watch. Overall, he looked solid against 2nd and 3rd stringers. Let’s see what he does in playing time earlier than the fourth quarter before we move him up the depth chart. Sammy Watkins: Great sign to see him catch the first three passes. He looked healthy, confident and ready to have a big season. Jonathan Williams: Very impressive running before suffering a hamstring injury he says is not serious. Ran hard, hit the holes fast, showed speed. I feel very good about him as LeSean McCoy’s backup. Mike Tolbert: Showed his versatility in running, catching and blocking. The Bills haven’t had a big back like him in a while. Eddie Yarbrough: The star of training camp had a sack, and cemented his spot on the roster as a backup at defensive end. Trae Elston: The backup safety made two nice plays on the ball. The first was called for pass interference, a questionable call. He showed aggressiveness breaking on passes. There are jobs open at backup safety. Joe Powell: Same story for another young safety. His interception was a nice play, and he puts himself squarely in a position to battle for a job. Taiwan Jones: Yes, he dropped a pass and had a bad catch interference call. But he was downfield first on nearly every kick. He was brought here for his special teams skills. He already looks like the best gunner on the team. Reggie Ragland: The most analyzed third stringer on the team had a nice tackle for loss. That should help his confidence and let him settle down and start playing football, no matter what the position. Overall, there wasn’t enough to get too excited about this Sean McDermott debut. Too many penalties and mistakes need to be cleaned up. It’s one down and three more to go. Wake me up when it’s over.